Frontierland, like the rest of the Magic Kingdom, is filled with stories, story tales, and fictions. There are a few corners of the small western town, however, that takes some of the most fantastic true life anecdotes and sprinkles them in with the tall tales. Of course, in the immortal words of Maxwell Scott in The Man Who Shot Liberty Valance, “This is the west, sir. When the legend becomes fact, print the legend.” This edict is precisely what Disney has down with some of the wanted posters along the exit of the Frontierland Station of the Walt Disney World Railroad. 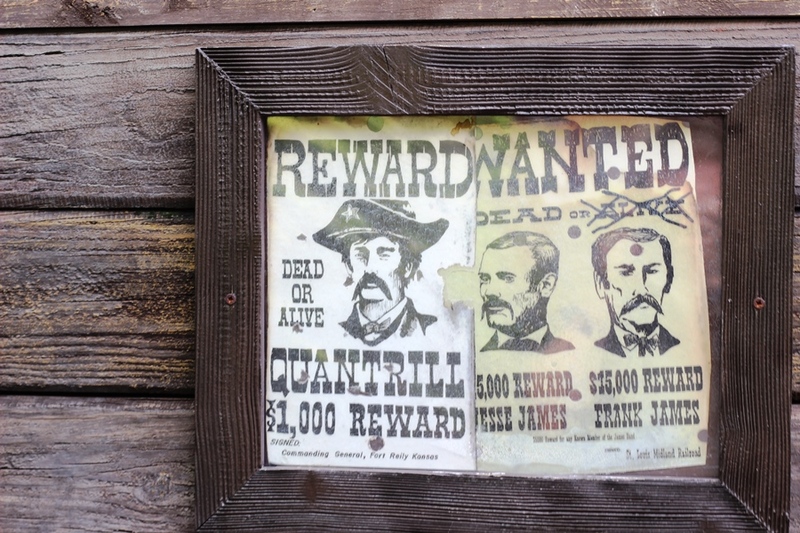 The first set of posters depict three outlaws who knew each other well. Quantrill is short for William Clarke Quantrill, a bandit who worked mostly in Missouri and Kansas and utilized guerrilla strategies, some of the most brutal tactics, to apprehend runaway slaves before becoming a pro-Confederate gun-for-hire whose bandits were known as Quantrill’s Rangers. In 1965, just after Lee surrendered to Grant, Quantrill was injured by Union forces during a skirmish in Kentucky. He would succumb to those wounds in just a few weeks. 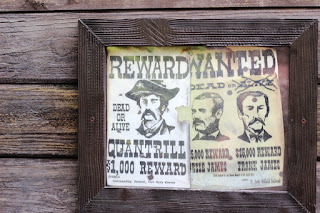 Two of the more notable villains to ever ride as a part of Quantrill’s Rangers were the brothers, Jesse and Frank James. As part of the James-Younger Gang, they would commit bank robberies and raids on trains from Iowa and Texas all the way back to West Virginia. Jesse was shot by Robert Ford, but Frank would go on to turn himself in, be acquitted, and held odd jobs the rest of his life. The posting here of their wanted status as dead, speaks to the heinous nature of some of their crimes. In the second posting box, we pick up with the Younger side of the James-Younger Gang, with the brothers Cole, Jim, and Bob, though there was a fourth brother as well, John. Party to the bank and train robberies, they would meet their end in a robbery gone wrong. A raid on the First National Bank of Northfield, Minnesota went sideways and the entire gang, including all of the Younger brothers, was killed. The only two to make it out alive were Frank and Jesse James. While his counterpart is posted here, Butch Cassidy and his partner, the Sundance Kid, terrorized banks and trains throughout the latter portion of the 1800s and into the early 1900s. Their gang, the Wild Bunch, received the most notoriety, not to mention a massive manhunt, from their robbery of the Union Pacific’s Overland Flyer in 1899. Butch and Sundance, along with Sundance’s girlfriend Etta Place, fled to South America in 1901. Though it is believed the pair were killed during a standoff with law enforcement in San Vicente, Bolivia, there are those who dispute when and where the pair died. On the last pair of postings on the walkway down from the train station, we start with John Wesley Hardin, also known as Little Arkansas. Hardin is your typical gunslinger who got in trouble early and often for murder and lived his life on the run. He would have a pair of encounters with another legendary gunslinger, Wild Bill Hickok, before eventually being captured and serving seventeen years for his crimes. Once freed, he passed the bar, but never strayed too far from the short-temper and quick-draw that had made him a folk hero. It would be his heated words with a lawman that would lead to his death in 1895. Last, but certainly not least, on our greatest hits of the west’s most wanted is Sam Bass. A train robber by trade, Bass would be a part of a gang that pulled off one of the largest train heists at that time, the 1877 robbery of a Union Pacific locomotive for $60,000. He would attempt to form his own gang sometime later, but the success of his early gang would never be duplicated for him. A member of his gang would turn against him and the information he provided to the Texas Rangers allowed them to set-up an ambush for Bass. During his attempt to flee the shootout he was shot and killed. From the way most of these short tales ended here today it's clear that crime may only pay in the short term. You may get a pretty wanted poster like these gentlemen did along the railway depot’s exit, but in the end all that you’re left with is a story. 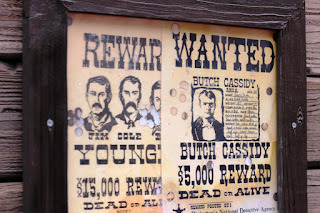 With Frontierland being so imbued with fabled tales of the west, there wasn’t much need to include some of the real life villains who prowled the frontier. 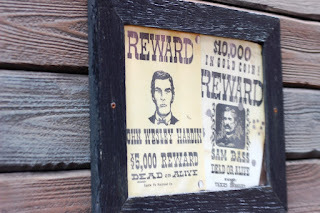 Yet, it adds that certain bit of grit to the story that makes me love Frontierland even more!